휴, 베트남의 홍 티엔 루비 호텔 | 호스텔월드에서 예약하세요. The following group types are not accepted by this hostel: High / Secondary School, Stag/Hen/Bachelor Party, Sports Group, Cultural Group If you have misrepresented the type of group you are booking for, your booking may be cancelled by the hostel." 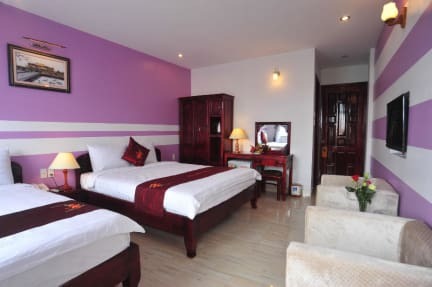 HongThien Ruby Hotel is a private-hotel, located in the center of Hue city. It is easy access to many tourist attraction of Hue city and very convenient for individual tourists, groups and business people. Hong Thien Ruby hotel is equipped with all amenities that you expect: air – conditioning, international standard, internet ADSL, wifi, cable TV, mini bar and more. 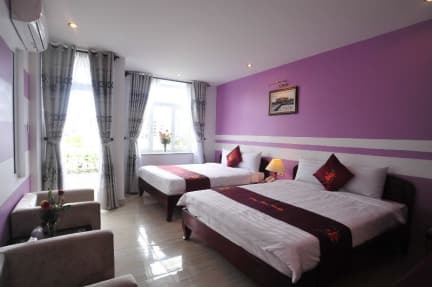 Hong Thien Ruby hotel allow you to enjoy all famous attraction of romantic Hue: Restaurants, Shops,The Perfume River, Trang Tien Bridge, the Old Citadel , The Tombs of the Emperors .